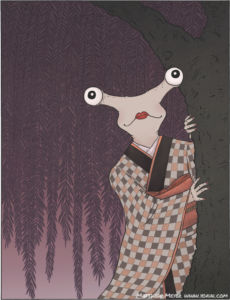 APPEARANCE: Shumoku musume has a head which resembles that of a hammerhead shark or a snail. She has large eyes which extend out from the sides of her head. She wears a furisode kimono, usually worn by young, unmarried women. 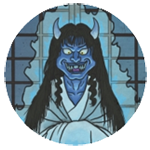 ORIGIN: Shumoku musume is not a major yōkai, yet her image is fairly well known. This is because she was included in obake karuta, a yōkai-themed version of the popular card matching game karuta. Although no story accompanies her in obake karuta, her card says that she appears on the Usui Pass, which separates Gunma and Nagano Prefectures. The word shumoku refers to the wooden hammers used to strike temple bells. It is not clear if shumoku musume is a tsukumogami of a bell hammer, or if her name merely refers to the fact that her head resembles a wooden hammer’s head.